A cell phone application proposed by a team of NIU students might someday make working and living in war-torn countries a little bit safer. 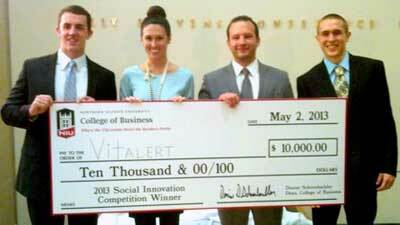 The four-student team, operating under the name Vitalert, won the NIU College of Business’ second Social Innovation Competition. The class challenges teams of students to create a business plan for a company that could not only be profitable, but also improve life for those in need. NIU business instructor Dennis Barsema, a veteran entrepreneur himself, teaches the class. Barsema created it not only to teach students how to write a successful business plan, but also to encourage social entrepreneurism, a business model that strives to not only turn a profit but also to meet a local or global need. Barsema offers $10,000 in seed money to the winning for use as seed money to launch the business. 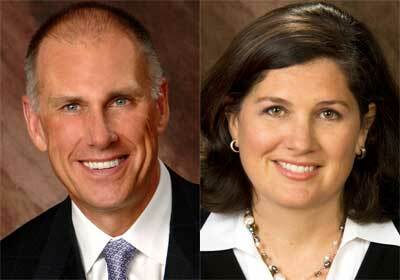 While offered by the NIU College of Business, the class accepts applicants from across campus. Vitalert included two business students (Mike Cahill, a graduate student in accounting, and Zach Fiegel, marketing), an engineering student (G. Addison Merchut, a graduate student in mechanical engineering) and Kaitlyn Lynch, a student from the College of Liberal Arts and Sciences who is majoring in community leadership and civic engagement. For their project, the team created a business plan that calls for the development of a cell phone app that would send text messages to customers living war-torn regions alerting them to battles, acts of terrorism and other issues in their immediate vicinity in real time so that they can protect themselves. Customers would also be able to upload reports of trouble to alert fellow users in the vicinity. Deciding on what the product would be was actually one of the most difficult parts of the semester-long class, says Zach Fiegel of Vitalert. “We had a lot of great ideas, but we also had a lot of people on the team good at poking holes in ideas,” he says. Once they settled on their idea, the team was guided through the grueling process of creating a business plan and presentation by Barsema and by professor Christine Mooney, who team-taught the class. The teams met for one lecture a week, and then worked one-on-one with one of the teachers once or twice a week. Barsema and Moody worked with two teams at a time, switching off at the midpoint of the semester. The instructors provided advice and critiques and, as needed, recommended business professionals who might offer guidance. All of the teams impressed the judges. In the end, Vitalert won out because of the quality of its market research, the diversity of its management team and the ability to build the project up to a large scale in a very short time. The team received $10,000 that can be used either as seed money to launch the business, or to donate to a charity of their choice. They are still pondering their options. Another of the judges, Alan Hurt, hopes the team pursues the business – it is what he and his teammates did when they won the initial competition last year. And, while Hurt is the only member of that team still pursuing the project, it appears poised to launch within the year. 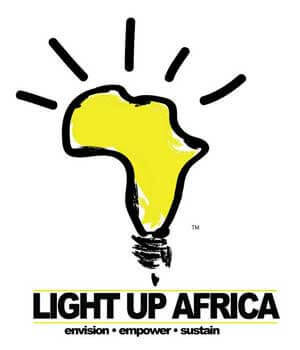 That team, Light Up Africa, conceived of a simple device to generate and store electricity to allow families a safe alternative to kerosene lamps and to handle small chores like cell phone charging. Familiar with the African marketplace, Hurt believes Vitalert could catch on quickly in places such as Nigeria, which the team proposed as its first market due to the combined factors of ongoing violence and the prevalence of smart phones in that country. Regardless of whether the team moves forward with the project, Merchut says that he is grateful for the experience. ReDevise developed a concept for a business focused on helping inmates successfully transition to life outside of prison. They envisioned a holistic approach consisting of training and counseling and an employment component to provide qualified Candidates with opportunities to build new lives and the necessary tools to take advantage of those opportunities. Student Team: Darin Burns, Gabriel Chavez, Salvador Jasso and Liz Rytych. Serving Success devised a business plan to develop a culinary education platform to assist those who live near or below the poverty line. The plan also called for the creation of a restaurant in DeKalb County where graduates could showcase their skills while training and looking for work. Student Team: Rachel McBride, Ashley Burgess, Maurice Onayemi, Paul Morrell. Tree of Life devised a business plan to create cooking briquettes from coconut shells to be used in place of typical charcoal briquettes. The typical briquettes are used for indoor cooking in many third world countries and the smoke created is laden with carbon monoxide and carcinogens. Their plan called for manufacturing the product in Nairobi and to begin marketing the product in Kenya. Student Team: Alan Baxter, Dominique Ware, Michelle McNabb, Ted Keller.